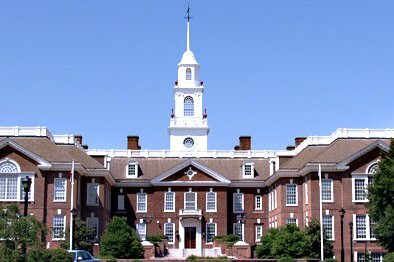 The Delaware Legislative Hall in Dover. Two Republican lawmakers in Delaware walked out of a legislative session Wednesday during a prayer reading from the Quran, with one returning later to call the reading from the Muslim holy book "despicable." The News Journal reports state Sens. Dave Lawson and Colin Bonini exited the Senate chambers in Dover when Tarek Ewis, imam of the Masjid Isa Ibn-e-Maryam mosque in Newark, and Naveed Baqir, executive director of the Delaware Council on Global and Muslim Affairs, gave the day's invocation per an invitation. The Senate proceedings resumed as normal afterward, but President Pro Tempore David McBride, a Democrat, would eventually address Lawson's remarks in a written statement. McBride said he was "personally offended" by the comments and called it a "sad chapter" in the legislative body's history. "And for our guests today to be branded as anti-American when our First Amendment of our country’s Constitution explicitly guarantees the freedom of religion is both ironic and deeply sad to me," McBride said, according to The Associated Press. Despite Lawson taking such exception to his reading from the Quran, Baqir told The News Journal he was trying to have a positive outlook on the situation. He said he'd welcome Lawson to come visit one of the state's 12 mosques, which serve a population of about 10,000 Muslims, and noted that the day's proceedings likely wouldn't have gotten the same attention if it wasn't for the senator's comments. You can read more from The News Journal here.